Notions: 7" Zipper, Eight 5/8" Decorative Buttons, One 5/8" Flat Button, 3 yds. of 1/8" Cording, Two Hook and Eye Closures. 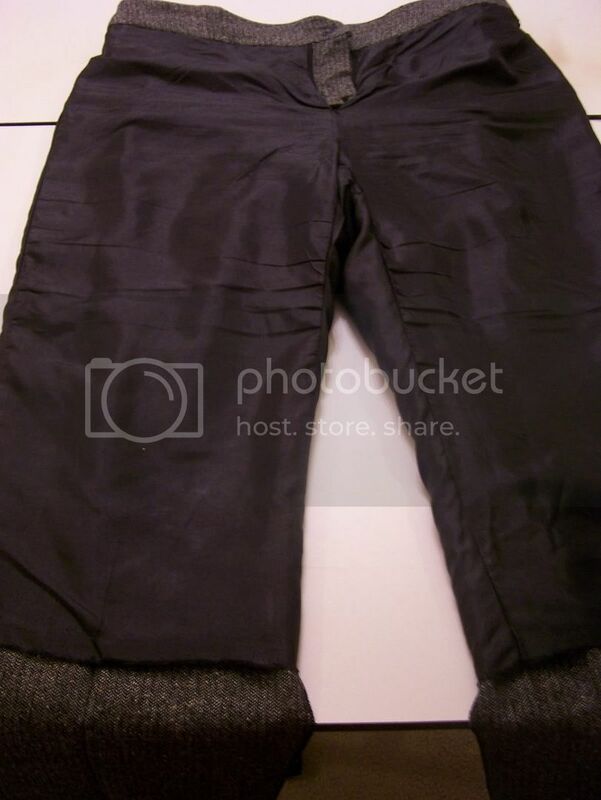 Description: Semi-fitted, straight legged pants has side slant pockets with button tabs, fly zipper closing, loops, topstitching trim and piping. 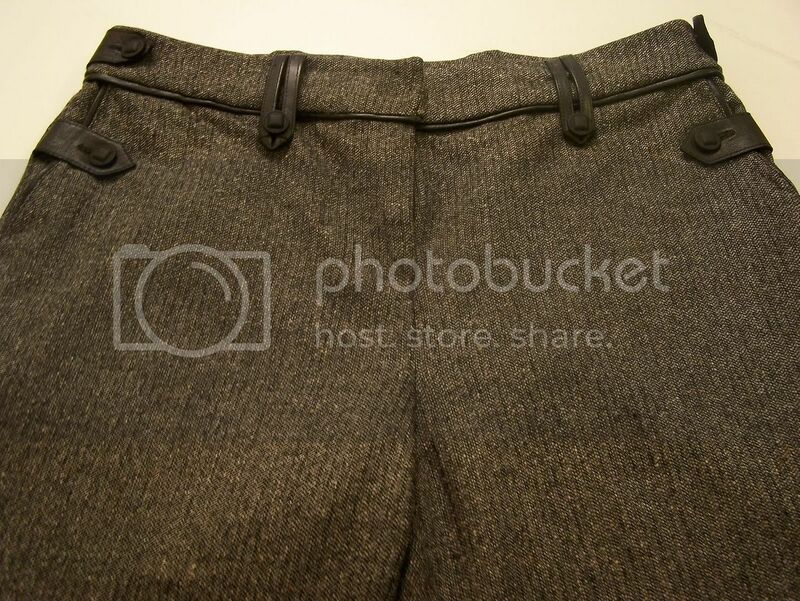 This is Vogue Pattern's version of Badgley Mischka's pants from their Fall 2007 collection. When this pattern was first released, I knew I would make these pants. They have great details that really made them unique. After looking at the line drawing, knew right then that I would add my own special touches. I made my usual pattern alteration of lengthening. I added 5" to the length. 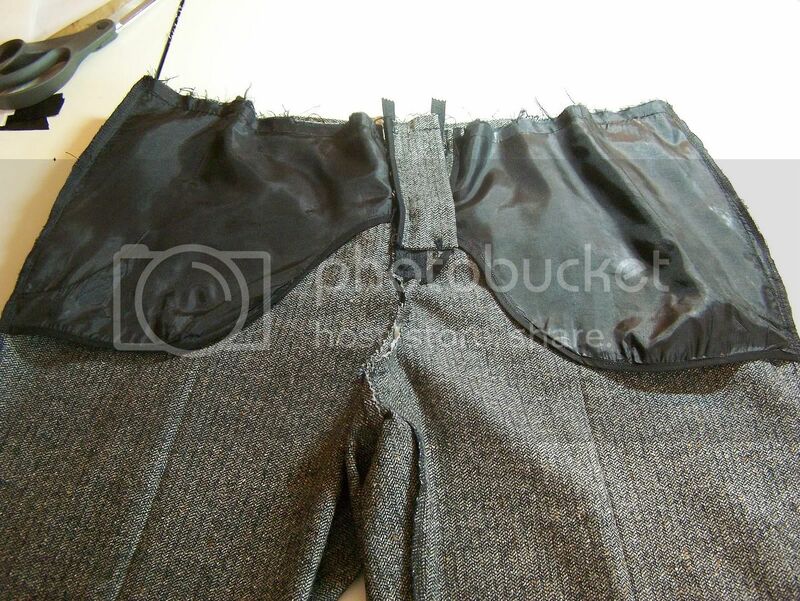 I also took in the CB seam on the pants and waistband 3/8". Also, 3/8" on each dart. 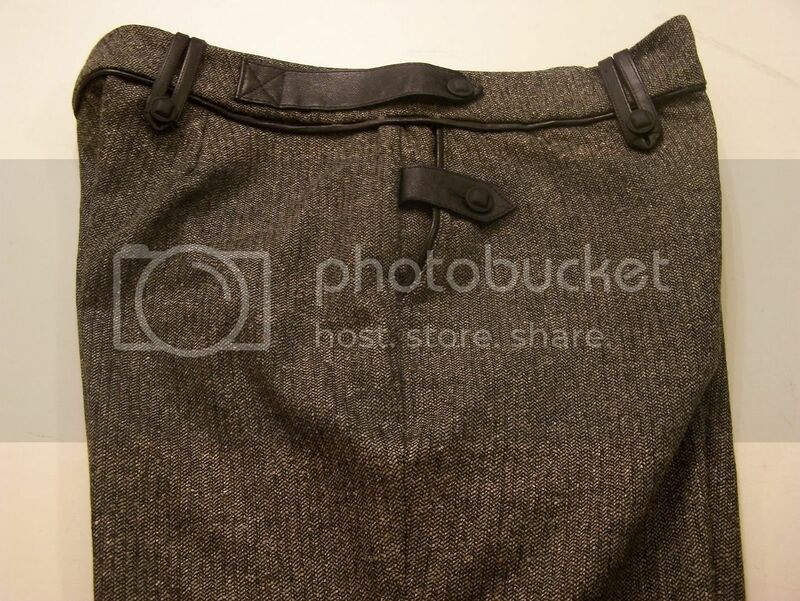 These pants have those great front pockets that most of us love... the ones that connect to the center front. This keeps the pockets lying flat. The pocket seams are finished with seam binding. 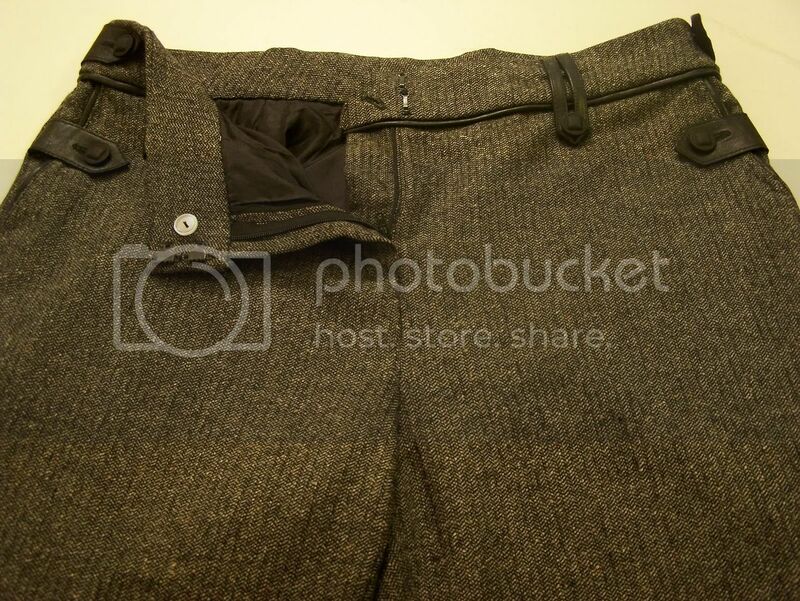 I find it interesting that the pattern recommend tweed and wools and didn't provide instructions for a lining. I like all of my dress trousers, especially those of the wool variety, to be lined. I decided that I only needed a partially lining... in places that would be itchy and to prevent baggy knee. I cut my lining 5" below the knee. I cut the lining on the cross grain and used the selvage for the hem. I used "Easy Guide to Sewing Linings" as my reference. I made my tabs and piping from leather I recycled from an old leather skirt. I made my piping by cutting leather strips on the bias and using postal twine for my cording. I used "High-Fashion Sewing Secrets from the World's Best Designers" as my reference. Since it was leather, I used a lot of glue to assist me. I sewed the piping using my zipper foot. I made the tabs by gluing two pieces of leather, wrong sides together and then cutting them out. I topstitched and trimmed close to the stitch line and made machine buttonholes. For the belt loops, I followed the instructions and applied glue as I folded. Once the glue was dry, I used a warm iron and a pressing cloth to flatten so the leather would be more pliable. Then I topstitched. I sewed on my decorative buttons and my closures and finished with a 2" hem. 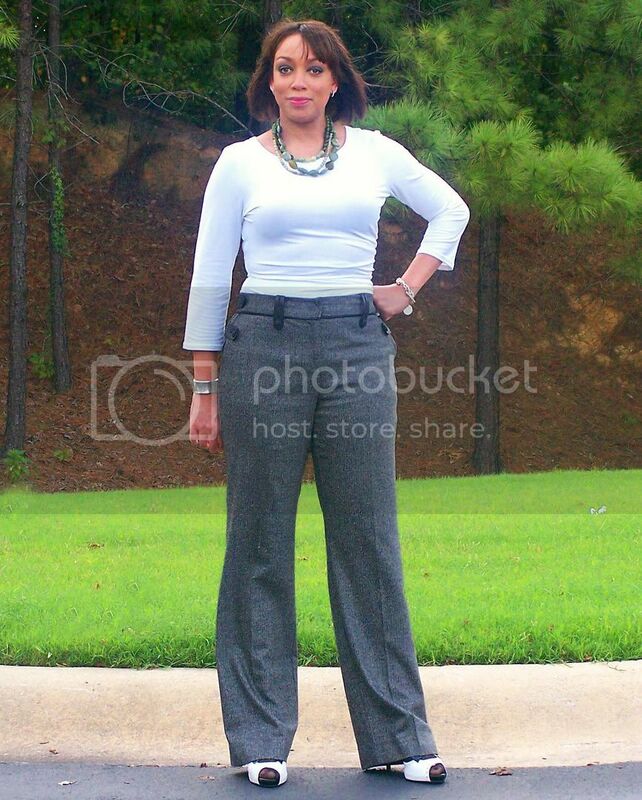 I recommend these pants if you'd like something with a little more style to them. I think these would look great in linen also, so I'll probably make these again next Spring.